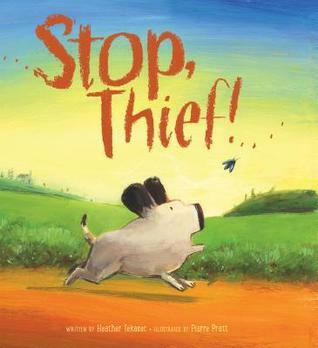 Learning from Picture Books: STOP, THIEF! I have a soft spot for books about dogs, and this one is very cute. It is another one of the books nominated for this year’s Blue Spruce Award from the Ontario Library Association. Of course he can! Max can catch anything! So off he runs to find the thief who’s been stealing all the carrots, berries, beans and cherries from the farmer’s fields. Max is so eager to help that he convicts the first suspect he finds—a bug. But the bug escapes, and Max chases it all over the farm while the other animals “guard” the food. Unfortunately, Max is too busy eating and giving advice to realize they might be part of the problem! Stop Thief was written by Heather Tekavec and illustrated by Pierre Pratt. It was published by Kids Can Press in 2014. I really liked the concept of this story! It’s so much fun the way the dog is focused on one reason for the problem but the illustrations and other animals are telling a very different story. I wanted to turn the pages to find out whether Max figures out what is really going on. The illustrations in this story are lovely and give the animals, and especially Max the dog, a lot of personality. At first glance, there appears to be a lot of text on each page, but the big, clear illustrations make up for that because readers at the back of a group will be able to see what is happening while the story is read. The story moves along quickly and I think the humor would hold students’ attention. During a second read through, it would be fun to discuss what clues Max should be noticing. Choose one of the animals in the story and find out about what they like to eat. Make animal puppets using craft sticks and paper, and use them to retell the story. Write the next page for the story – what do you think will happen when the animals wake up? I don’t usually review nonfiction middle grade books, but I think this is an important book for middle schoolers to read, or to at least be aware of in case they need it. how to create the life you dream of having. From inspiring "roems" (rap poems), survival tips, personal stories, and quick quizzes, this book will light the way to a brighter future. This updated edition also features new, never-before-seen content including a chapter about how to talk to parents, an epilogue, and an exclusive Q&A with the author. 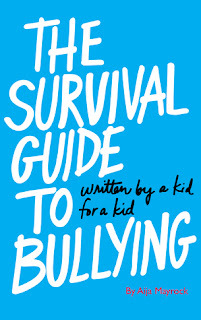 The Survival Guide to Bullying was written by Aija Mayrock and published by Scholastic, Inc. in 2015. 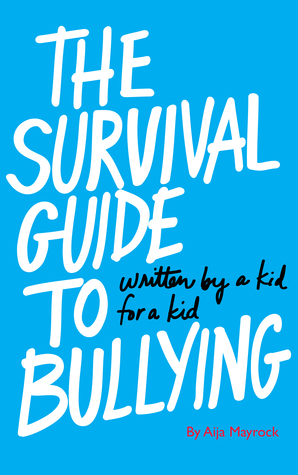 Since this book was written by a teen who was actually bullied, in the very least it will help other kids in similar situations realize they are not alone. Although there are other nonfiction books about bullying, this one contains the author’s own rap-style poetry which demonstrate one way to deal with negative feelings. I really liked the writing style and the voice of this book, because you feel like you are talking to someone rather than just getting advice. I wish I had a book to read like this when I was a teen. Highly recommend this book for any school library or teen’s bookshelf. Aija Mayrock began writing the book when she was 16 and finished it when she was 19. She is now a writer, actress and filmmaker. This is another one of the picture books on the short list for this year’s Blue Spruce Award from the Ontario Library Association. I really enjoy fractured fairy tales and this one was a lot of fun! Ruby loves red things. She especially loves the red cloak her grandma made her. But unlike that other girl once upon a time, when Ruby puts on her red cloak, she becomes SUPER RED RIDING HOOD. A delightful combination of something old and something new, Claudia Davila’s Super Red Riding Hood captures what it means to be an everyday superhero. 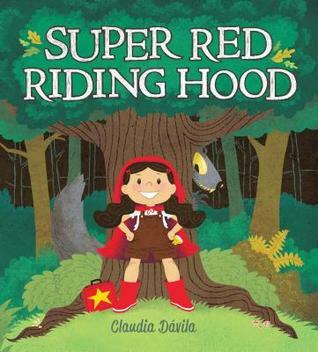 Super Red Riding Hood was written and illustrated by Claudia Davila. It was published by Kids Can Press in 2014. The way Ruby used her powers through the story was fun. Any child could relate to her and I especially loved her as a role model as a strong girl. Fractured fairy tales are always fun because they can be read along with other versions for comparing and contrasting. What superpowers did Ruby use in the book? Draw a picture showing Ruby using another superpower. Brainstorm ideas for ways you could be a superhero and do good deeds like Ruby did. Draw a design for your own superhero cape. What would you call yourself as a superhero? Read another Red Riding Hood story. How are the two stories different? What is the same about them? I am not a big fan of hockey, or most sports, so I don’t read many sports-related novels. But even though I tried to put this one down a few times, I ended up reading it straight through. This is one of the nominees for the 2016 Silver Birch Fiction Awards from the Ontario Library Association. When Rocket gets cut from his AAA bantam hockey team, he needs to re-evaluate his priorities. Bryan Rockwood (aka "Rocket") is faced with the unthinkable: being cut from the Huskies — the AAA hockey team he has played on for three years. With no other teams interested in him, Bryan reluctantly joins a AA team, the Blues, at his best friend Maddy's insistence. Things only get worse when Rocket sees that the Blues don't take hockey seriously. Facing the Huskies in the round robin will give Rocket the chance to prove his skills, but in order to keep his hockey dreams (and his friends) Rocket will have to realize that while hockey is his passion, it is not his entire life. Rocket Blues was written by David Skuy and published by Scholastic Canada Ltd. in 2014. A great read for any kid who loves hockey! This book is full of exciting hockey moments with lots of details about the action in the game. I liked the main character, Rocket, and was rooting for him to get on a team and win some games. His optimism and kindness made him a likeable character. He sorted out his friendships with members of his old team in a believable way. Rocket’s friendship with Maddy made me think about different kinds of families and family relationships. As a writer, I was impressed by the way the author wove in different subplots to make a compelling read, even for someone who doesn’t enjoy hockey. 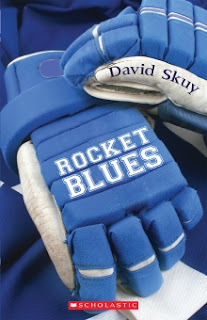 David Skuy has written several middle grade books about hockey and a series about soccer. His middle grade novel, Undergrounders, won the Silver Birch Award in 2012. The unique illustrations in this book really stand out! It’s on the list of books nominated for this year’s Blue Spruce Award from the Ontario Library Association. When a little girl moves to a new town, she finds a place called Butterfly Park. But when she opens the gate, there are no butterflies. Determined to lure the butterflies in, the girl inspires her entire town to help her. And with their combined efforts, soon the butterflies—and the girl—feel right at home. friendship, and wonderment in the beauty of everyday life. 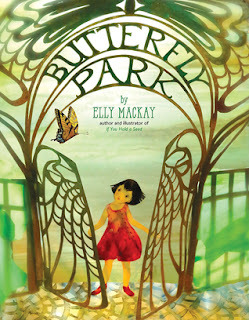 Butterfly Park was written and illustrated by Elly Mackay. It was published by Running Press Kids in 2015. This story is a good example of a plot where a main character starts with a problem – why are there no butterflies in Butterfly Park? The attempts to solve the problem are appropriate for the girl’s age level. I liked that it was written without a name for the main character, so anyone could put themselves in her place. This story may spark a lot of discussion about taking care of the environment and ways children can work on solving problems. It’s also a good model for talking about story structure. There is lots of detail in the illustrations, so it would also be a good book for demonstrating how pictures can tell a story. What is your favorite page from the book? Why? Draw or write about it. Write a mini story and create your own paper theatre diorama to illustrate it. Create the life cycle of a plant using a paper cut out art technique. Make a paper garden with paper flowers and butterflies. You can also find an art extension activity on Elly Mackay’s website. Each year for the past six years, I've challenged myself to read 100 children's books. Why children's books? Because that's what I'm compelled to write. For any writer, I think it's important to read a lot of books of the kind that you want to write. I'm convinced it helps to embed the structure, style and language of the kind of book you want to write in your mind. It also helps you to find out what kinds of books your audience likes to read, and, in the process, you learn about the kinds of books you'd like to write. Along the way, I've come to appreciate the art form of children's books beyond my own learning as a writer. There are few extraneous words in children's books, there isn't space. The writing is highly polished, the stories beautifully creative. I treasure my time spent reading children's books, and I'm proud to be able to attempt stories of my own. What does this mean for my reading goals? Since I'm doing more writing and have less time for reading, this year I'm going to be a little less specific about what I choose to read. Instead of focusing on the quantity of children's books I want to read, I'm aiming for diversity. I want to read more different kinds of books -- maybe some nonfiction, maybe some children's books that I wouldn't normally pick up. I will continue to list the children's books that I read here and, hopefully, on GoodReads.com, if I can remember. I may make it to 100, but I may not. I like to see what I find. I also like to read books nominated for awards. Most of the books I read are based on recommendations from other readers and writers, as well as from what I find in my local library. If you have any recommendations for me this year, please share them in the comments! 1. Read LOTS of children's books - picture books, middle grade and young adult. 2. Read all of the fiction picture book finalists (I better read these ones, because I'm a second round judge!) finalists and the middle grade fiction finalists for the Cybils Awards, and maybe some of the finalists for speculative fiction for elementary and middle grades, if I have time. (For more about these awards given by book bloggers, visit www.cybils.com). 3. Read all of the Blue Spruce and Silver Birch nominees for the Ontario Library Association's Forest of Reading Awards. 4. Try to remember to keep track of my reading on GoodReads, though I'll also be tracking it here on my blog. I'm excited to begin! Do you have any reading goals? Feel free to share or link to them in the comments. I'll be back Thursday with a Learning from Picture Books feature and then next Monday I'll have my first featured post for Marvelous Middle Grade Monday in 2016. Happy reading!